I have done a lot of posts about birds lately so I thought I would change things up. These are a series of shots from last winter taken with what was then a brand new lens – it’s now one of my favorites. 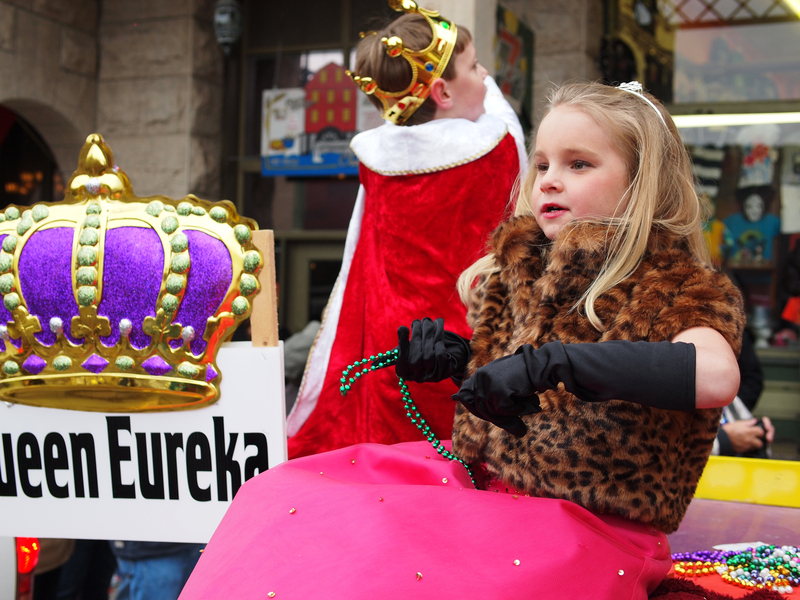 I live in a small village in the Ozarks called Eureka Springs and we love parades! Christmas, St Patty’s, Art’s Festival, VWs, Corvettes, Antique Cars, Diversity, Folk Music and more. 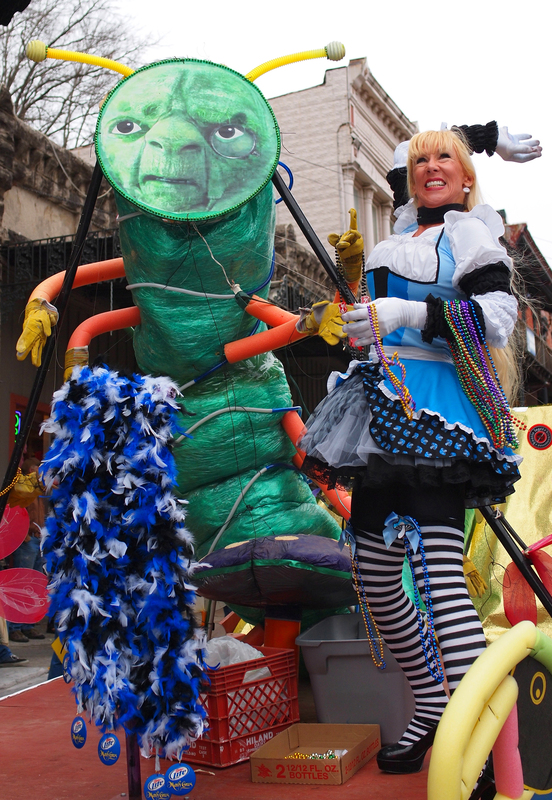 Most of our parades are a part of the party we throw for our visitors. 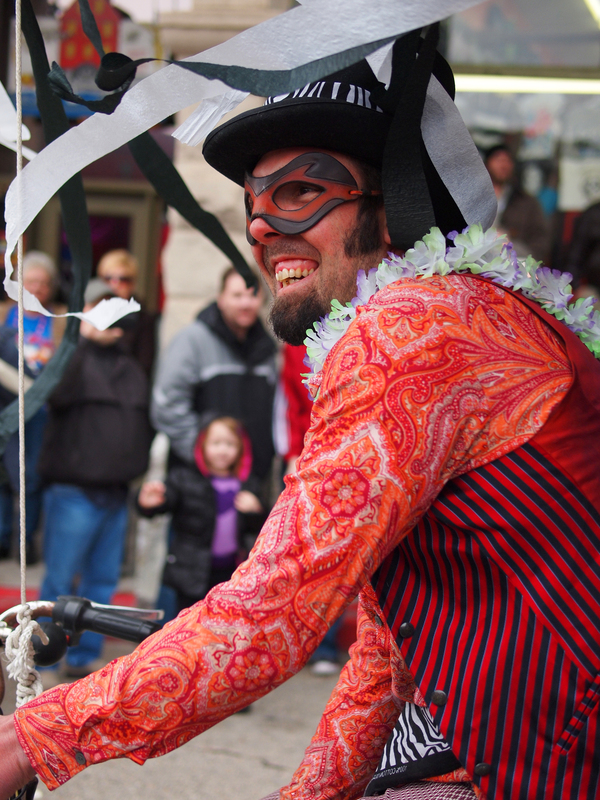 We host festivals on dozens of weekends throughout the year. Come see us during VW weekend and we’ll throw a party with a parade and you can be in it! But there’s one party we throw that is unabashedly about us. 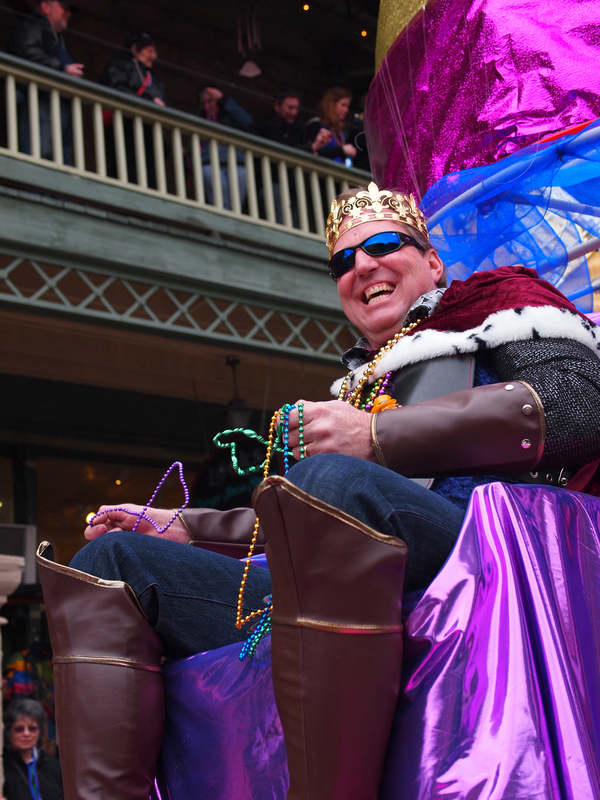 In the dead of winter we crown royalty from among our own citizenry and host a week of parties culminated by the annual Eureka Gras Mardi Gras Parade. It’s one of my favorites. 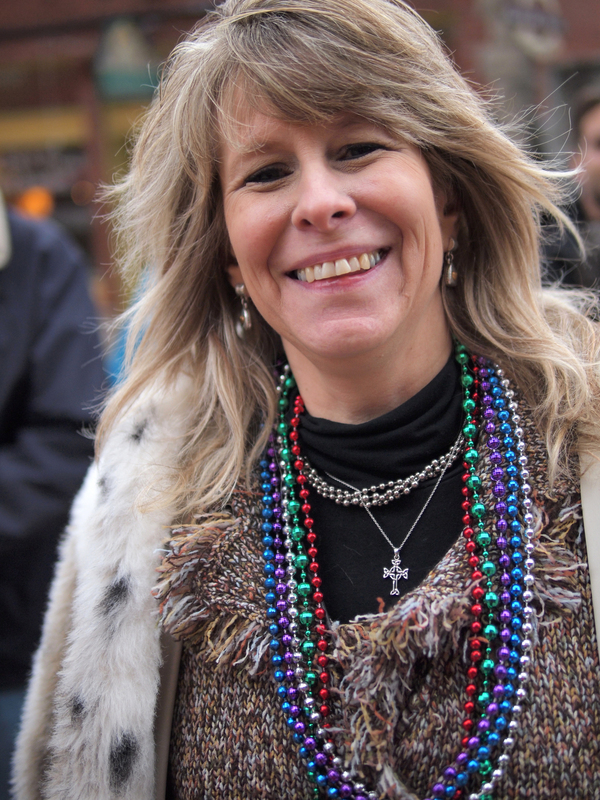 Instead of a visitor in a Model T, I get to see our own folk decked out in their best finery with beads-a-plenty. 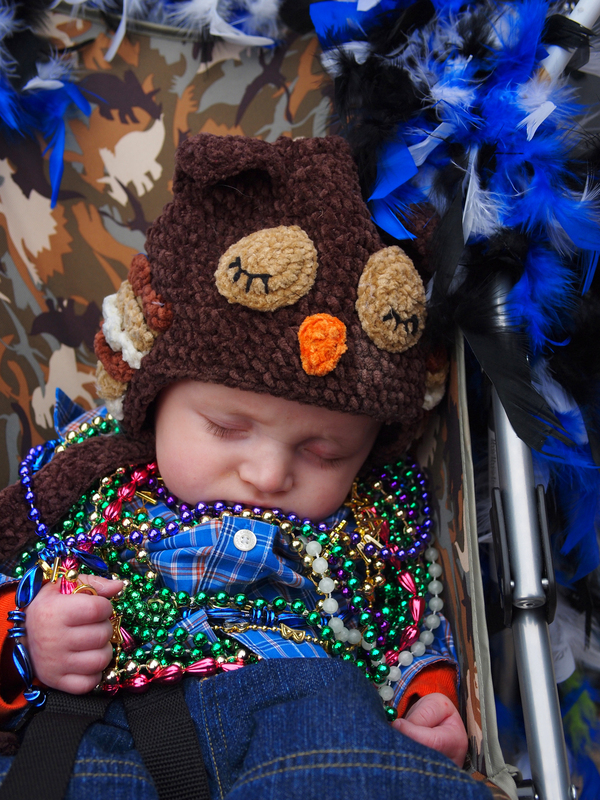 We’re not New Orleans – but that’s OK. Everyone’s welcome, even if you aren’t a Eurekan. Adding an ostrich feather sets just the right mood. This year I decided to make myself us only one lens. No bag, just my camera and a single lens and a strap. I had just gotten a Leica 25mm 1.4 portrait lens and decided it was the one to try out. I shoot a mirrorless M4/3 system so the focal length is equal to double the number so this lens is the equivalent of a “fast 50”. I love this lens and I love the freedom to just shoot. It was so nice to dive in and out of the crowd and not worry about my equipment. With our parades no one cares if you just jump in so I did and got as close as I could to those in the middle of the action. 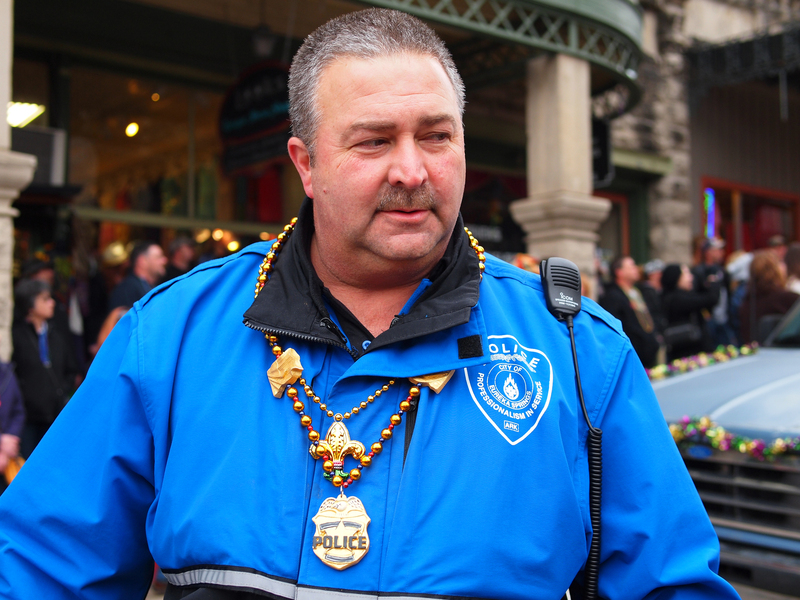 I think this guy might have been a Grand Marshall – I don’t think he got the memo about the dress code. I did not realize that I knew this lady until I posted the image on Facebook. 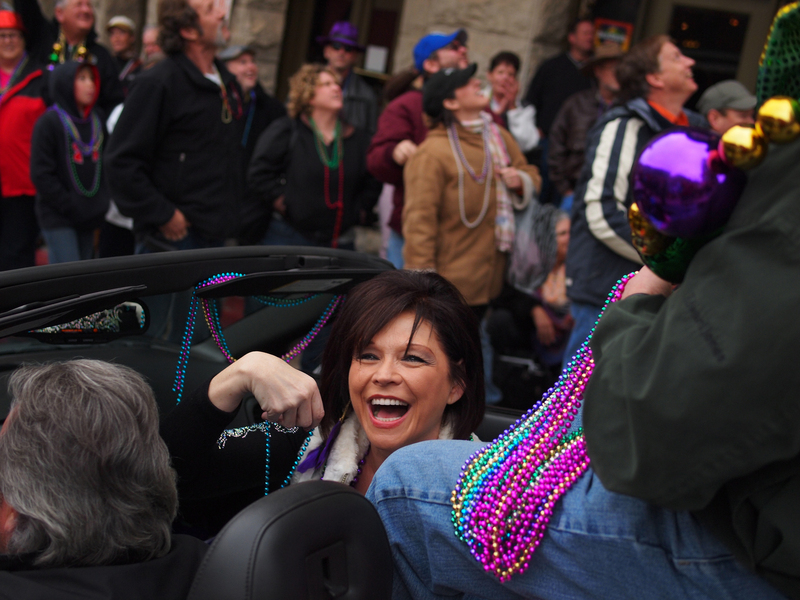 Of course it’s fun to shoot the crowd in between floats. The noise and the crowds make this parade a joy to be a part of and the faces of those in the parade echo those of us who were just watching. 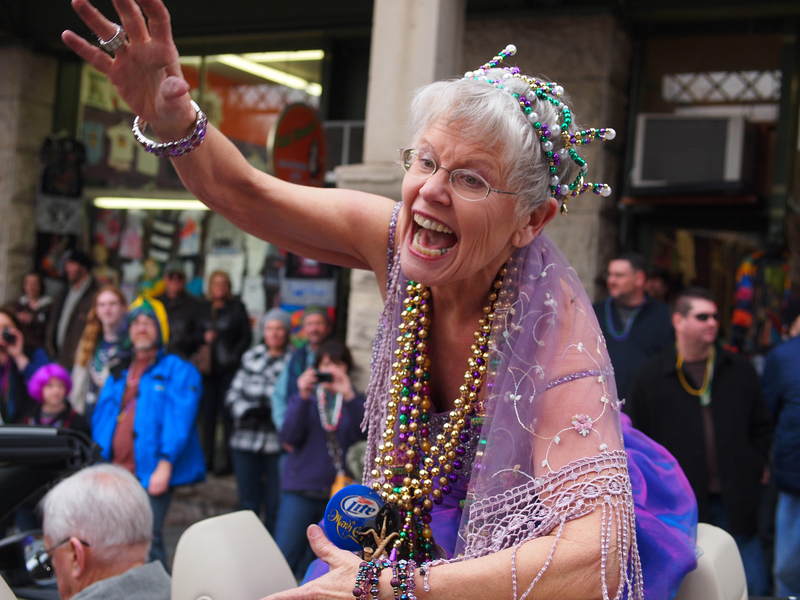 This is Judy – We both have birthdays near Mardi Gras so it’s just another party. One of the things I love about this lens is the way it can isolate the subject. Casual portraits are pretty easy to pull off. I love the control I have over the DOF. 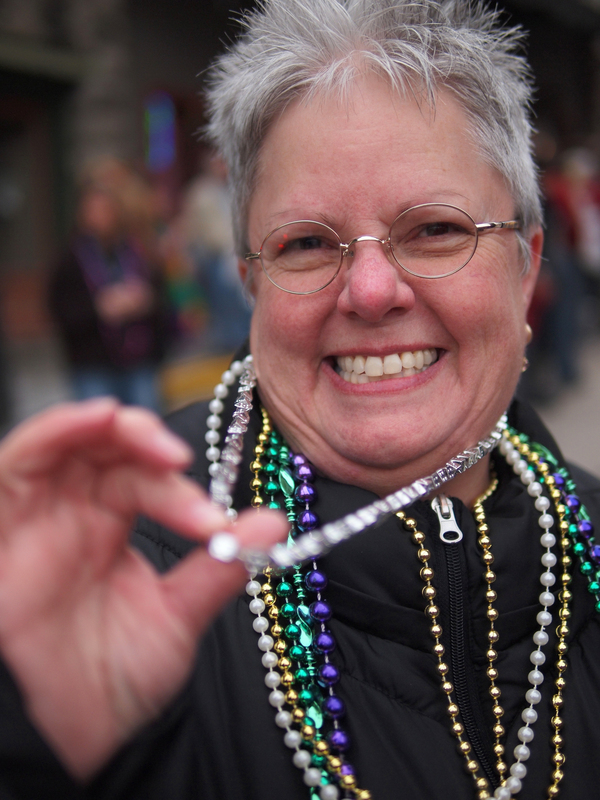 This is my neighbor Lynne – all beads and grins. As the royal court approaches the beads really start to fly. 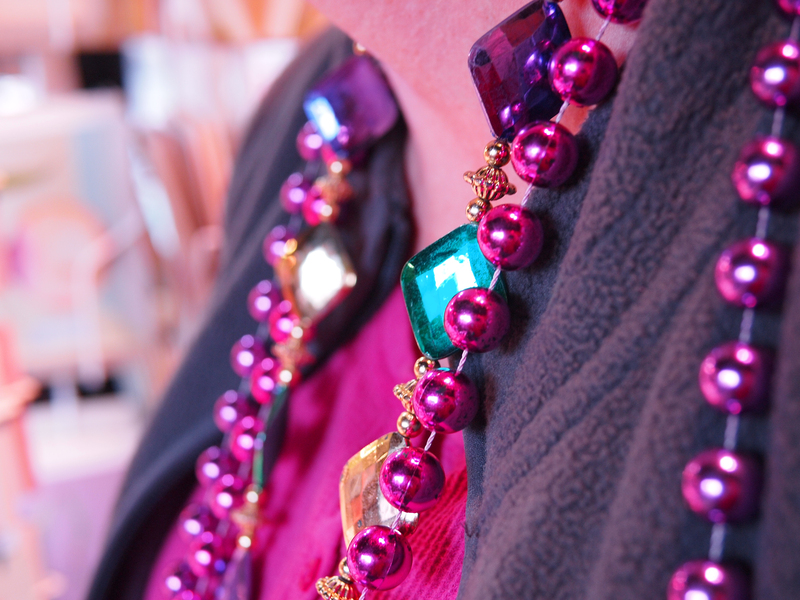 I was actually hit in the face several times – too busy trying to get the shot to go for the beads. 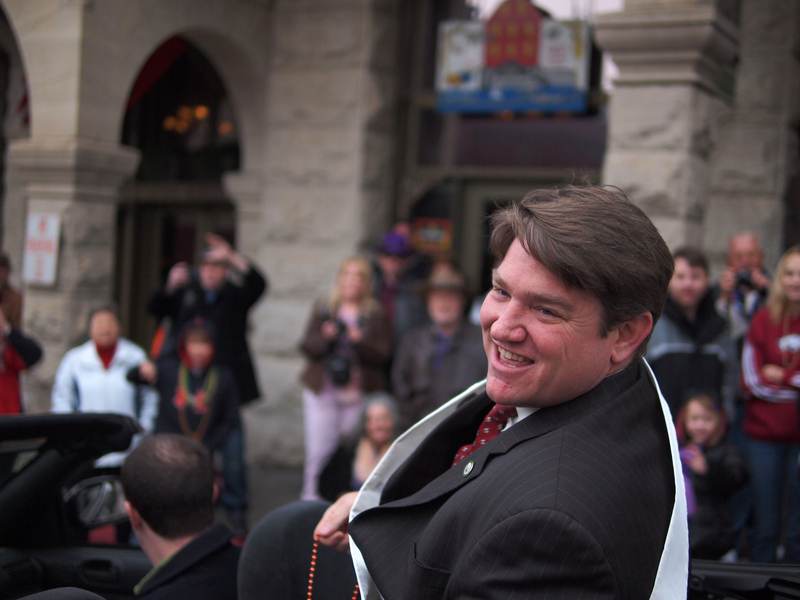 A member of the Court tosses beads into crowd. 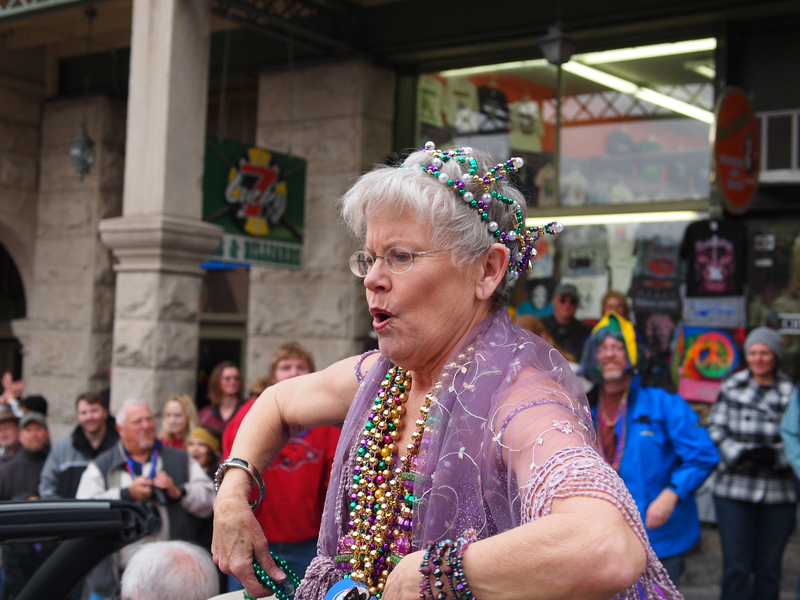 The next three shots are from a series of a woman who was originally from New Orleans – the gusto she had for the enterprise of tossing beads into the crowd were amazing – these were my favorite shots of the day – Duchess Pamela. 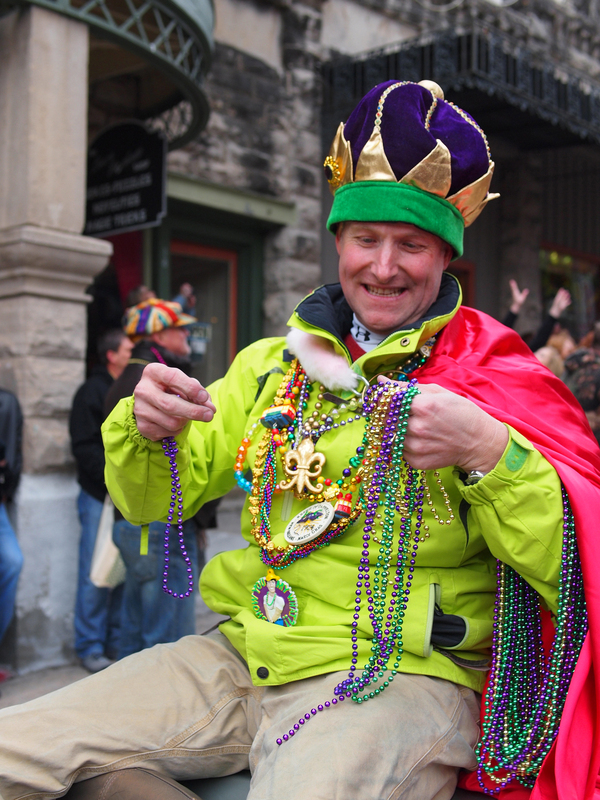 This Duke can’t quite get the beads free to toss. This gentleman owns the local Indian restaurant. I love his smile. This lens lets you pick a face out of the crowd. This is my friend and co-worker Sharon. 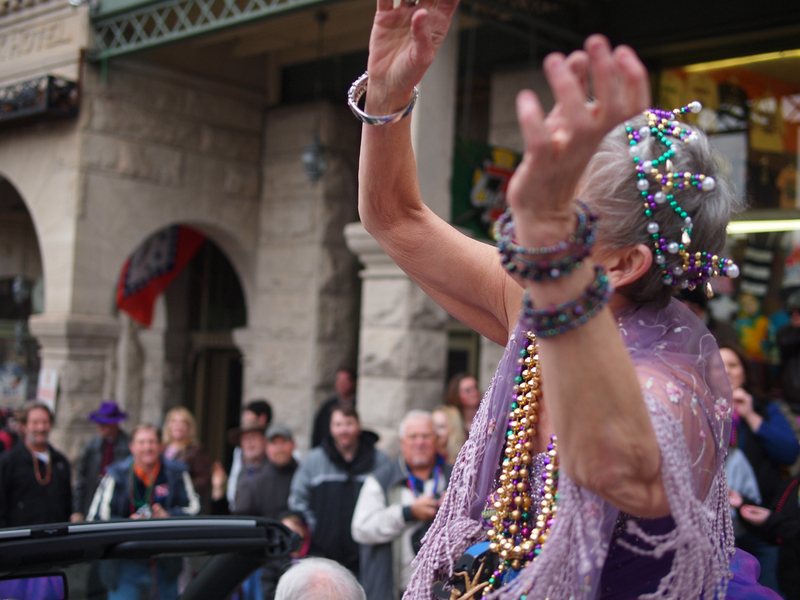 Beadmobile – the crowd’s looking up because beads are flying down. 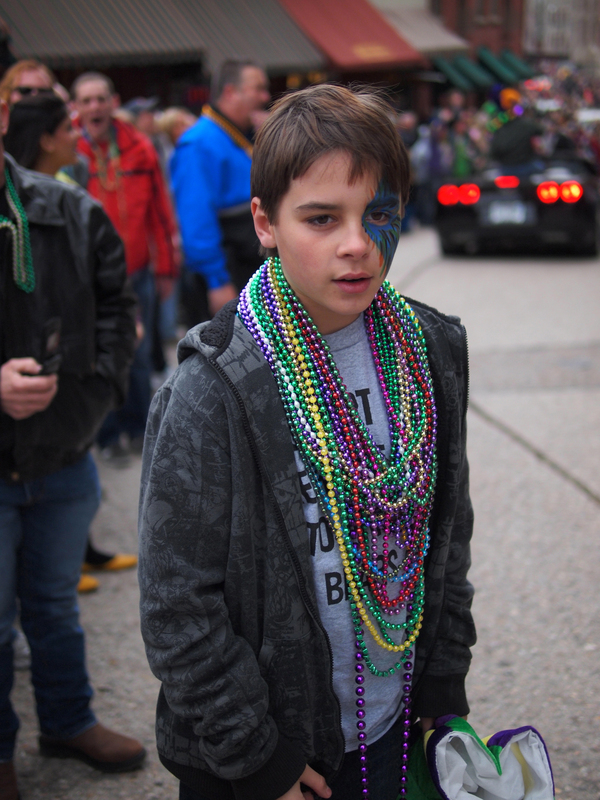 This young man was all about the beads – he was focused on grabbing as many as possible. This young man was in the crowd with us – his face painting is awesome. Some of the floats were quite tall so you get a chance to play with the perspective – the King towers above the crowd. In between the royal floats there were these fellows on bicycles. I love how this lens let me capture the streamers in motion. 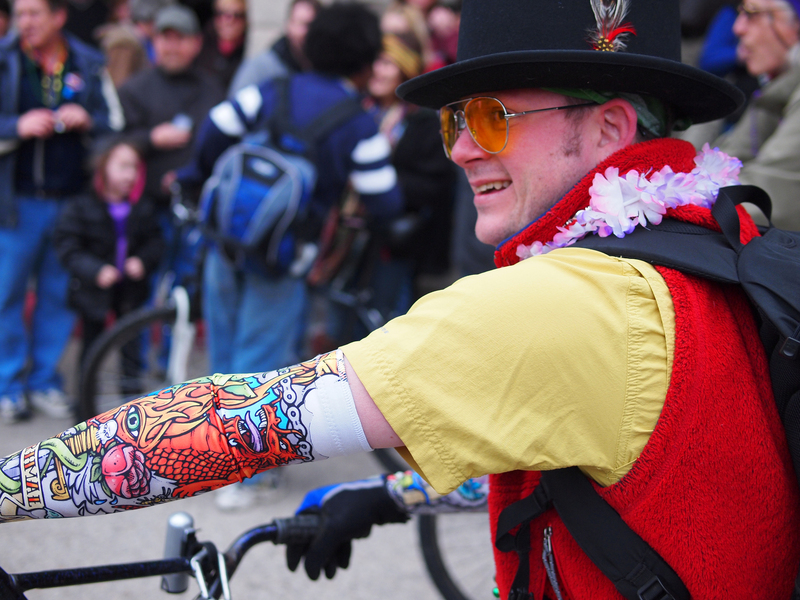 Steampunk Bicyclists follow the royal procession. I’m thinking this is a great idea for those who just don’t want to commit to a full sleeve full time. These kids we part of the Queen’s court – they did the bead tossing for her. 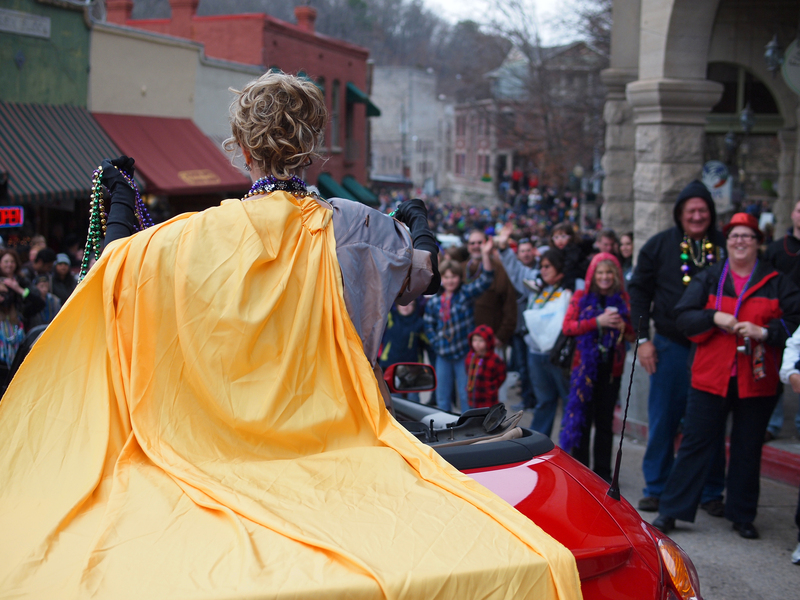 The Queen’s Helpers hoist beads into the air. Of course we needed someone to control the crowds and keep the peace. I typically try to avoid shooting into an overcast sky – but on this day the colors were so bright I shot up to get Alice letting loose. Looks like Alice has gone down the rabbit hole and come back with lots of beads. 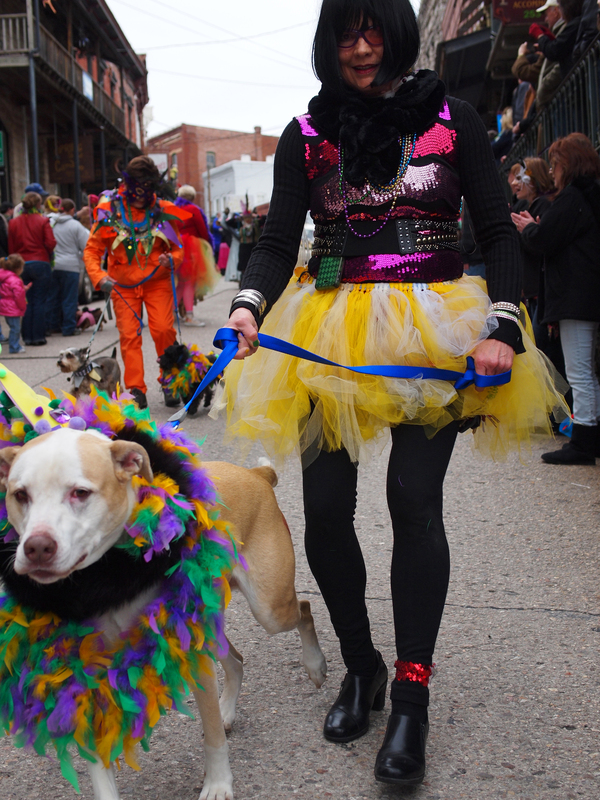 As the parade ended I got a chance to see some more locals adorned for the day’s events. This little guy was worn out. Amazing he could sleep over the brass bands. I love the way this lens made me get close. There were moments when I wasn’t just watching the parade, I was in it. 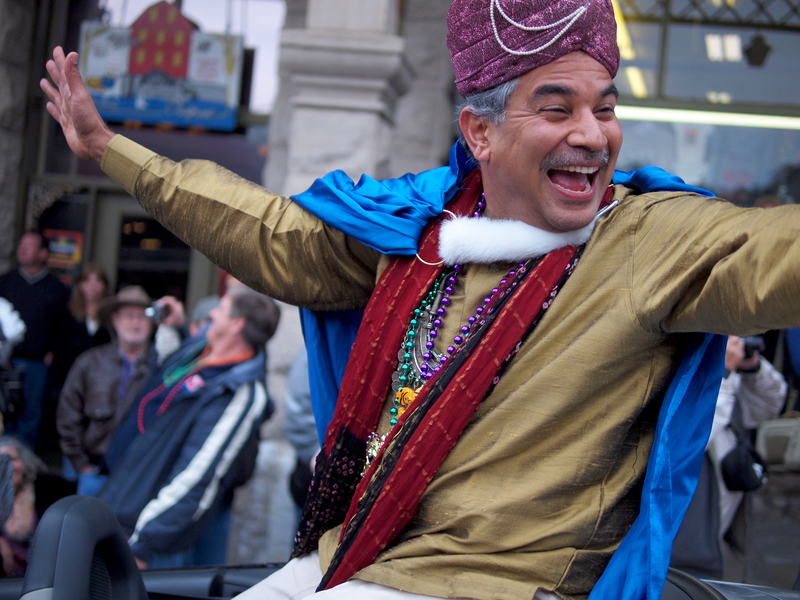 Now I don’t consider myself a street photographer – but I do love a parade. 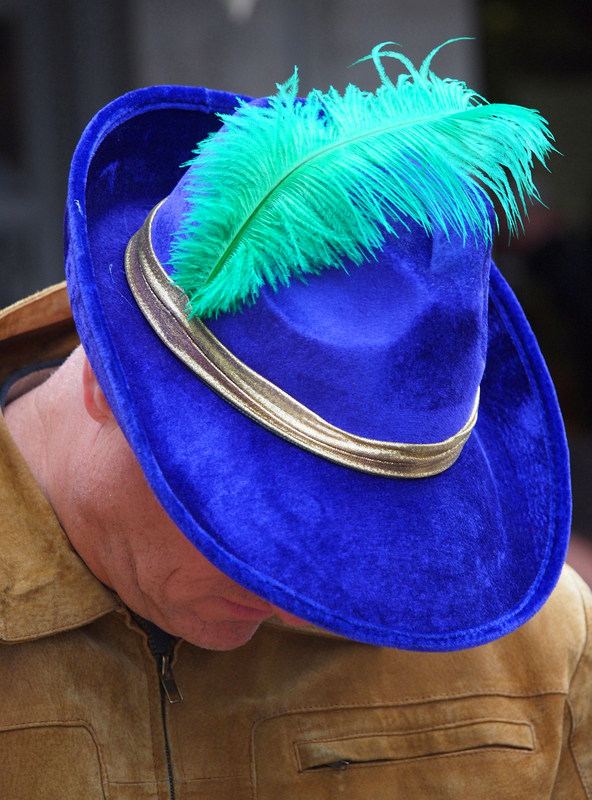 This entry was posted in Ozarks, Photography, Reminiscences, Travel and tagged Eureka Springs, Leica Panasonic 25, Mardi Gras, mardi gras parade, Olympus, Olympus E-M5, ostrich feather, Ozarks, photography, portrait lens, Street photography by artsifrtsy. Bookmark the permalink. Love this series of photos ! Thanks for the follow — I returned the favor. And I’m looking forward to more of your photography. I was hooked on your blog with the photos of the hummers and the woodpeckers that were highlighted on the WP page that tells you someone has followed you. I always look! I was delighted. I’m a bird lover but never manage to catch the picture. Maybe a real non-cellphone based camera would help! You ave captured the character of the people by the expression on their faces in a remarkable way. The atmosphere looks really friendly and fun. You ave brightened my day. The village you live in would be a great place to visit! Awesome photos and winter looks very bearable there 🙂 Where’s the snow?? We had a very mild winter last year – there have been years with beads in the snow – but nothing like Calgary:) Year before last we had a couple of feet of snow the week before and they almost didn’t get the roads cleared – after being cooped up the parade was a blast. What’s the population there? Have you lived there your whole life? 2200 people live in town. It’s the first town in the states that has a historic designation for the whole city. I’ve been here 10 years – I actually live about 4 miles north of town. I grew up in Las Vegas, but I love small town life. I left Vegas right after college – I have lived a few places – cities and towns. I know of most of the people in town, here I think you’re a newcomer for at least the first couple of decades:) Eureka is about the third most popular place in the US to get married, so like Vegas you see brides and grooms all the time. You should – it’s a day of smiles! These photos are fantastic ..thanks for bringing a smile to my face. Thanks for sharing these shots, Lorri. Gave me some good examples for that new 50mm lens I bought 2 days ago. I wish Australians in the street would allow me to get this close. But Australians, in general, are very camera shy. I’m excited to see what you can do with that lens Vicki. I think Yanks are not normally OK with this much intrusion into their space. I don’t think I could get away with this in a larger city for sure. I’ve never tried real street photography except to shoot the buskers here in the park. It’s the end of the 3rd day using the 50mm f1.4 lens, Lorri, and I must say I’m finding it really really difficult. I’m so used to using a telephoto lens (over the last 18 months). I guess you could say that since starting to use Manual mode earlier this year, I’ve been relying on the camera to do most of the work in calculating shutterspeeds. Now with this 50mm, I’ve got to work out where to put the focal point, work out which part is going to blur (on f1.4), think about the ISO, background, composition, light……… & so on. I think this 50mm is forcing me to finally work out the right camera settings using my own brain. Since cognitive disfunction was a contributing factor in my enforced early retirement from work, this learning curve is getting to be hard work. Having said that, I think I might have about 8 good photos out of the last 3 days. PS I can’t get over how sharp the focus is on this new lens. It’s remarkable. I’ve always had to sharpen the focus in PSE9 on every photo I took in the past. I think I shot several photos today that look to me like perfect focus. You are so right Vicky – there is definitely a learning curve shooting a prime. I tend to place my focus just point off center to start and then set my programable button on my grip to move it so that I don’t have to go back to the arrows. I usually shoot in Aperture mode but my first primes were manual focussing legacy glass so I did everything in Manual for a long time. I have been playing with some tilt-shift lenses and it’s like starting over. Nothing about them is automatic. Without live view I don’t think I could do it. Your shots are always so pristine and to know how much you have to overcome to get them is pretty humbling. 8 good shots are not bad for a new style of shooting – keep at it! You’re right Lorri. I feel like I’m starting all over again. Nothing is automatic. I was reading an article about tilt-shift lenses over the weekend and that sounds like hard work too. I’m probably at a similar place with them as you are with your 50mm.I’m not getting the number of keepers – but there are some I really like. I started attacking it very pragmatically – I have settled into a more spontaneous method. Wave – Wind Up – Follow Through 🙂 AWESOME. Thanks Honie – those three shots were my absolute favorite.